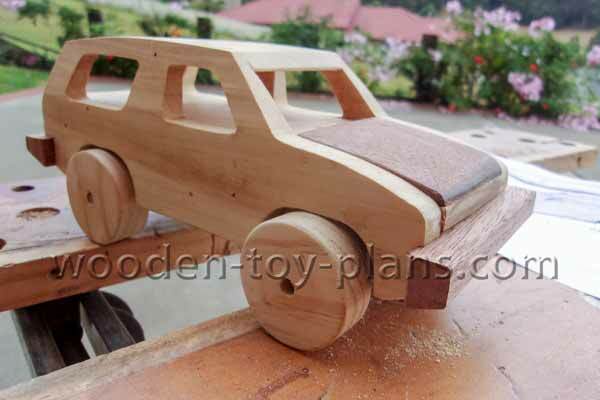 A few wooden toy car project plans for the woodworker with a certain set of skills. 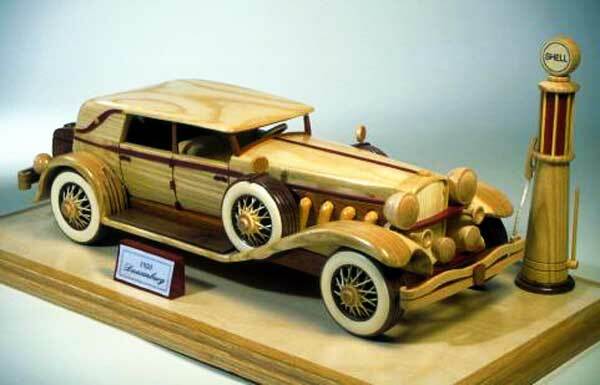 We do not often say this, but this beautiful automobile, with its boat-shaped trunk and carefully contoured parts, is more of a challenge to build than you might imagine. But oh, the results are incredible. From the editors of WOOD magazine. Buyers Guide provided to purchase spoked wheels. Table saw, scroll saw or band saw, drill press, clamps and other common workshop tools. 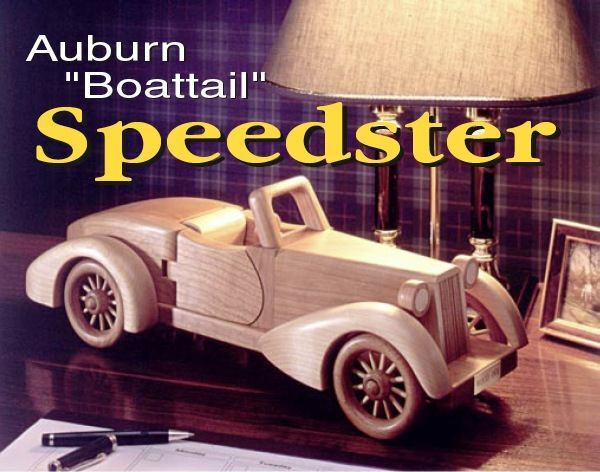 Duesenberg woodworking plans - Elegant Auto from last century. A distinctive automobile highly favored by the well-to-do in the 1920s and 30s. The sleek styling can be reproduced with common shop power and hand tools. The contoured components are shaped using a router and sanding. Three wheel styles are outlined in the plans including one with realistic criss-crossing spokes. The base pattern includes an identification plaque and inscription plus a 1930s style gasoline fuel pump. Lathe work required. A beautiful display piece in any setting. 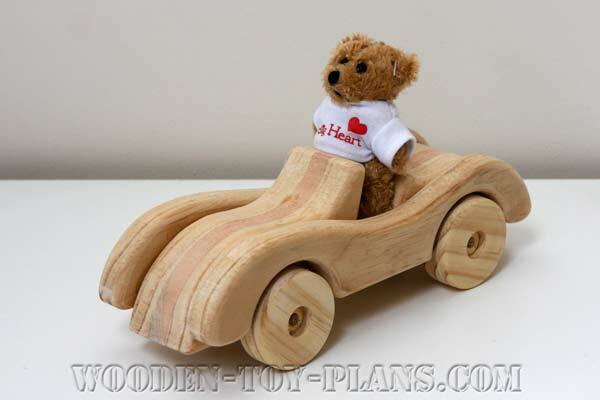 We do not sell a wood parts kit for this model, we only sell the building plan. 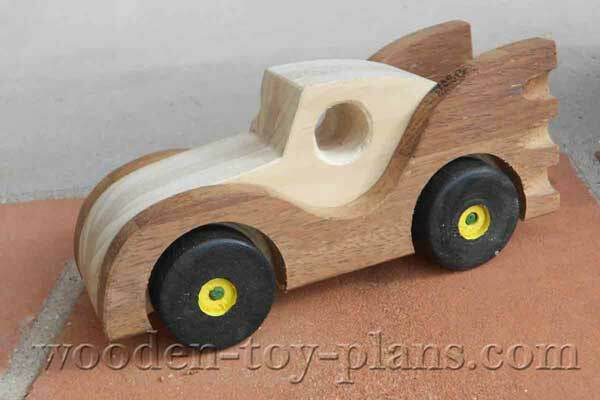 Antique lovers - This authentic looking 1930 MODEL A ROADSTER with its unique styling, is fun and easy to make. No special lights or wheels are required to purchase. Plans include instructions to make all parts. 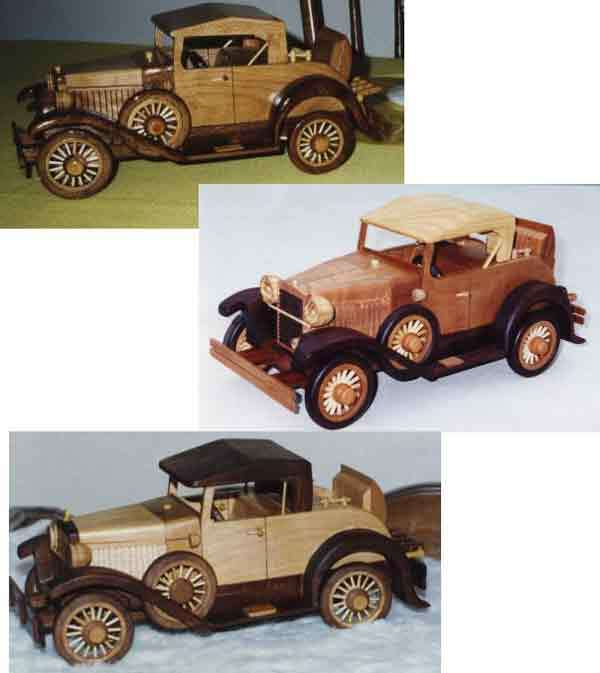 This realistic Wood Block Model is a big 1/12 scale and includes DETAILS like 6 each (16 spoked) wheels, complete frame assembly, optional top UP or top DOWN, kerf-lined seats, door handles (inside and out), lights, license plates and partial engine assembly OPERATIONAL PARTS include a unique steering with connecting steering wheel, folding luggage rack, and operating Rumble seat and all spinning wheels. 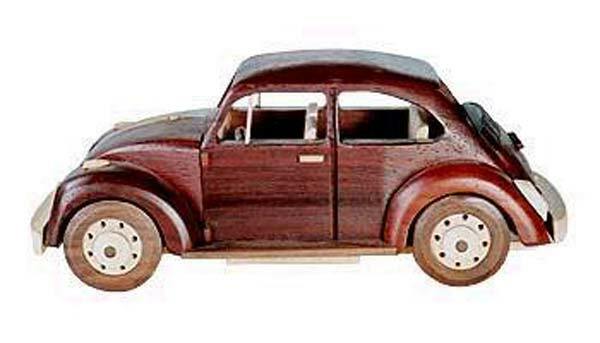 Bring back the fifties with the latest addition to your wood block model collection. This is a true to life MODIFIED 1957 replica. You make each part including the textured bucket seats and the deep sunk wheel rims with baby moon hub caps. Plans also include a detailed front and rear bumper, a detailed hood, and even side pipes. When completed your model will contain approximately 50 separate parts. 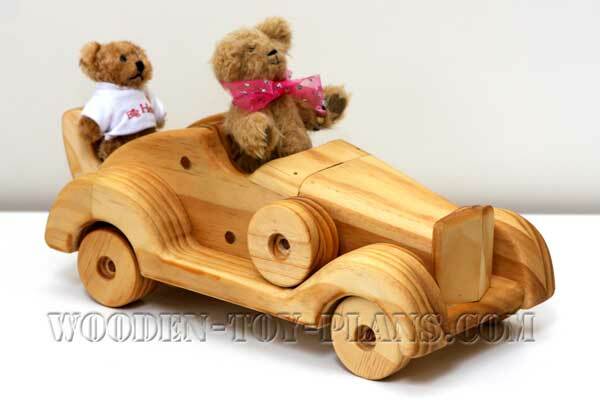 Great fun for shop projects or profit. AUTO BODY BUILDERS! It is important to have a good body these days and this Sports Car is loaded with powerful details. From its sleek, trim body styling featuring Side Coves, Dummy Scoops and Jetpod Taillights to the mighty detailed Dash, Grill and Bumperettes. Physical details also include interior Door Panels with Handles(inside and out), Transmission Console, and License Plates. Exercise your options to make the White Walls, Windshield and Convertible Top for a new healthy outlook on your collection. 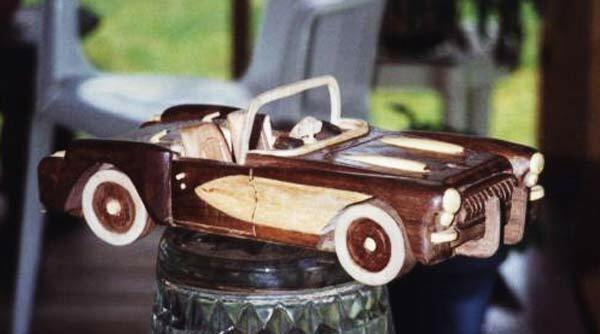 Now here is a muscle car to help you flex your woodworking abilities. Tail fins introduced in 1948, reached their most dramatic height in 1959. The most flamboyant automobiles to ever reach production with its wrap-around Windshield, radical body styling, lots of Chrome and Rocket and Bullet type lights. Plans include options for top UP or top DOWN, chrome accent inlays, multicolored seats, optional whitewalls, and plastic windshield made of household recyclable plastic. Plans also include Stand. This plan (Bug Parts) is not the creepy crawly variety type, and you will not go buggy trying to understand these easy to follow instructions and full sized cut outs sheets. Layouts are full sized model scale designed for beginners to intermediate woodworkers. Follow steps to assemble in order. 1928 Sprint Car. 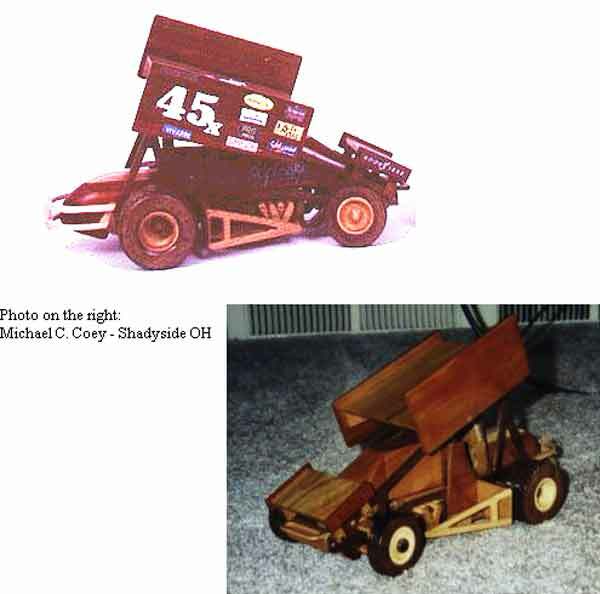 Bring some of the racing action back into your home or office with this replica of an authentic Sprint Car with this easy to make Tack glue or trace pattern. This Tack glue or trace pattern is complete with 3-dimensional exploded view location drawings, and full instructions to make all parts. Details include a unique frame design, exhaust headers, turning and spinning wheels, pivoting hood shroud, and also shows several styles of tire tread designs. 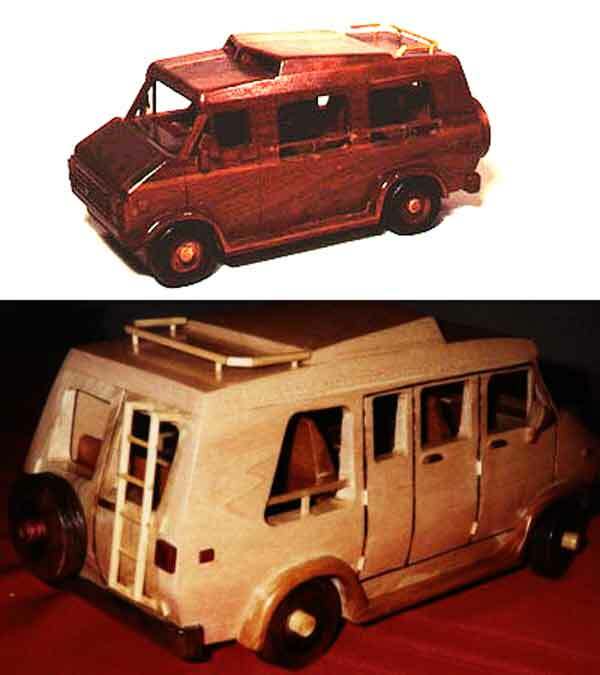 Woodworkers and Van Lovers! Now you can build your own CUSTOM CONVERSION VAN with these easy to follow instructions. 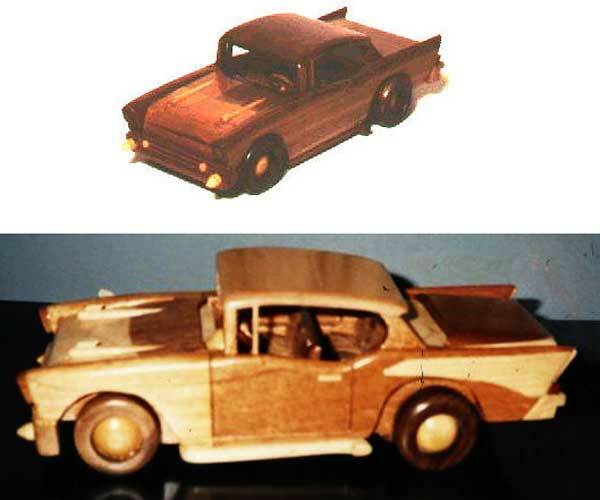 You make over 135 easy to make parts entirely of wood scraps, which can be painted to show off your artistic craftsmanship. 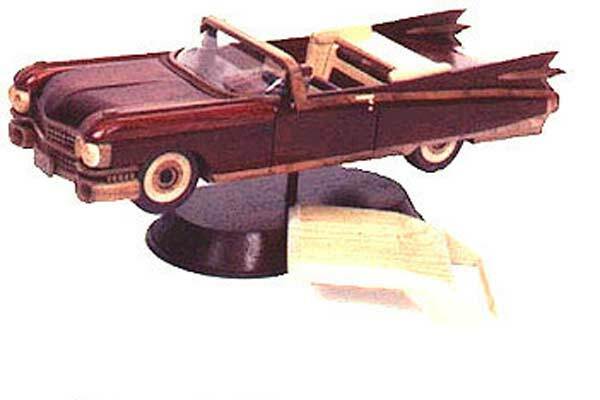 Complete with unique steering, aircraft seats, dash/console unit, and spare; with details that include a roof luggage rack, ladder, lights, shocks, mirror, and even a drink tray. Challenging for fun or profit. 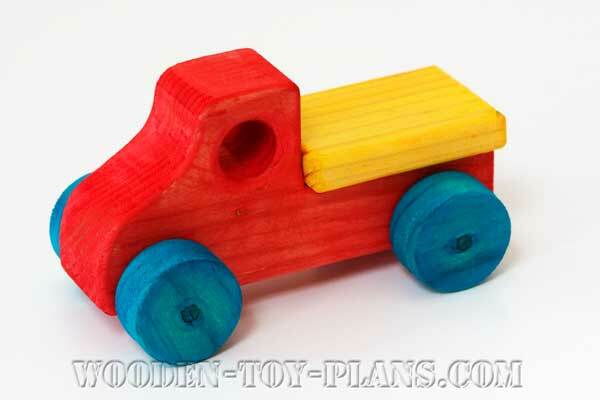 Simple and easy to make wooden toy car plans.